There are many improbable things that may or may not have happened in this episode, including murdered mannequins, pink feathered mini-dresses being allowing in an operating theatre, poisoned coffee, a bathtub full of frying oil, a cannibal brain disease and the Chanel's taking the MCAT's medical tests. And that last point did happen, the Chanel's took the MCATs. Not that any of the space-brained Chanel's would have ever even touched what is supposed to be the hardest test in the known universe. Surely you must know your hospital is in a dire situation when its future depends on fake medical students legally becoming real medical students. But the biggest mystery of this episode, beside wondering how any of the Chanel's are still breathing, is how they managed to graduate college. And it would be a medical miracle if there was a brain cell between the three of them! Even the MCAT for dummies book wouldn't have penetrated their diamond encrusted skulls. But the prospect of becoming the faces of a television show can make people do strange things. The show in question that convinces the Chanel's to study is called Lovin' the D. Sexual innuendo's aside, you really have to think outside of the box when it comes to bribing Chanel & Co to actually crack open a book. The bribery comes in the form of a mildly inappropriate show, staring a supermodel doctor. The fictional television show arrives at the door and mentions how they want to live-stream a surgery. If they don't take the test, it could potentially hit the show with a lawsuit and ruin Chanel's chance at becoming a TV doctor, a thing she has wanted to for a month, literally, a month. She is so ready to take the test that she asks if she can take it right away at the DMV. I guess dreams of cleaning up bodily fluids on a broadcast medical television show can make you forget that there three serial killers stalking the halls. 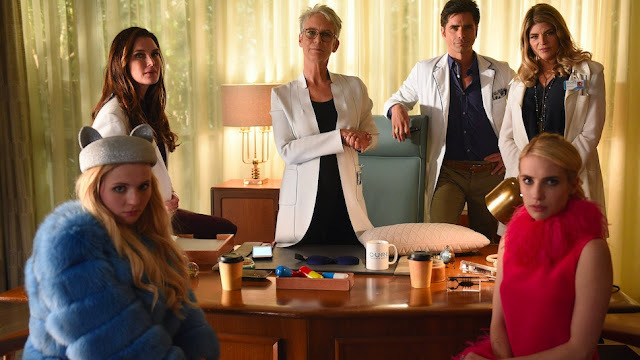 While Chanel is giving Holt a migraine and some killer urges with what is her version of "studying", there is a Green Meanie meeting taking place, with Hester presiding over the proceedings. They play a little game of who killed who by turning over a headshot of someone every time they admit who offed who. And lets take a look at the familiar face who turned up in the previous episode. Wes, who was one of Munsch's boy-toys in the previous season, now has sinister ulterior motives. He is the father of Grace, who, following the events of the previous season, had gone insane and got committed to the same asylum that the Chanel's had managed to slither out of.